I’m all about an oversized blazer! You may remember this piece from this post last year – it became somewhat forgotten in my closet over the last year, but I recently started wearing it again much more frequently. It’s always fun when you rediscover items in your own closet, don’t you think? It came as a short suit set, but lately I’ve just been pairing it with jeans (this Photo Ready fit from J BRAND is my fave!). For those of you working 9-to-5 jobs, this look is ideal for casual Fridays! This entire outfit has actually been repeated three different times in the last month. It’s just so easy and comfortable – it was perfect for the still-sorta-chilly New York days, and transitioned easily from day to night with just a switch of shoes and a bag. Any pieces you’ve found a renewed interest in recently in your own wardrobe? Also, how cool are these earrings? I wear them all. the. time. but it’s taken me forever to shoot them for some reason. They’re from the Anthropologie collaboration with BaubleBar and I just can’t get enough. Did I mention they’re under $50? Get them here. Looove that blazer, I was just thinking it would look great with shorts then I saw your old post. Shopping your closet is great! Nice blazer. I like the way you dressed it down with the flat sandals. Few things make me happier than rediscovering an old favorite in my closet. Glad to see you wearing the blazer again! The earrings look beautiful. I love it when you can basically shop in your closet and things are new again! 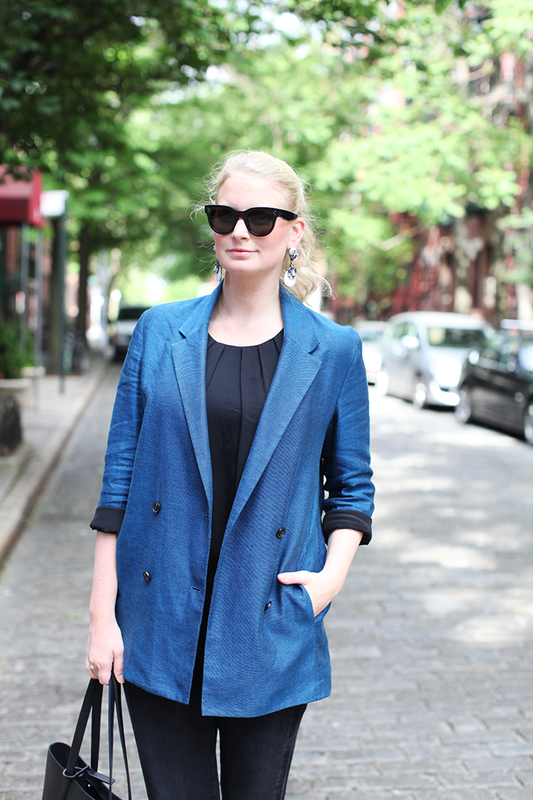 An oversized, linen blazer, ooh lala I love! Love a roomy blazer, I have a few of the vintage variety that I just love. Loving that shade though! I am intrigued by those jeans, I need a few new pairs, thanks for the info! I love it when you rediscover an old favorite in your closet! That blazer is great and I love those earrings! 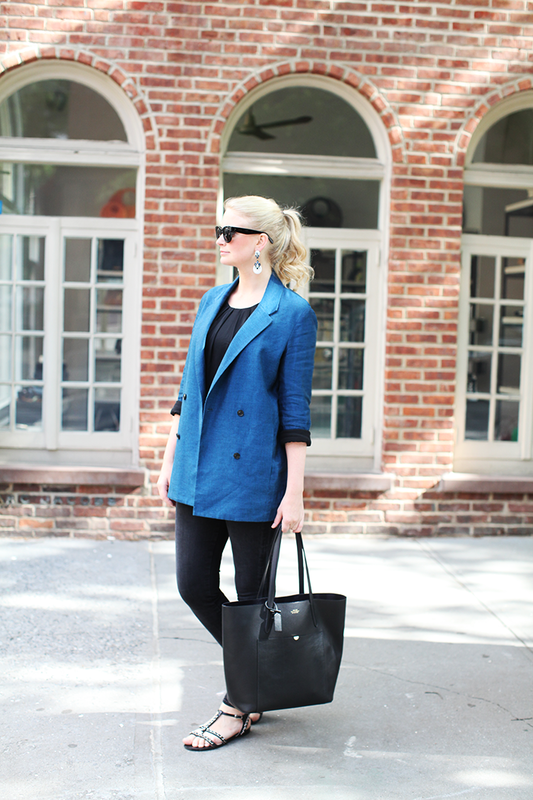 I am also on a huge hunt for an oversized blazer….and your blazer fits the bill for its chic look!!! I love blazers and oversized have that cool, relaxed vibe what they give to any look. And yet looking so put together and chic. Just like your look- relaxed, cool and chic. I LOVE this blazer!! Looks great and the earrings are beautiful!! Love the earrings and blazer. Oversized pieces are so fun to style. 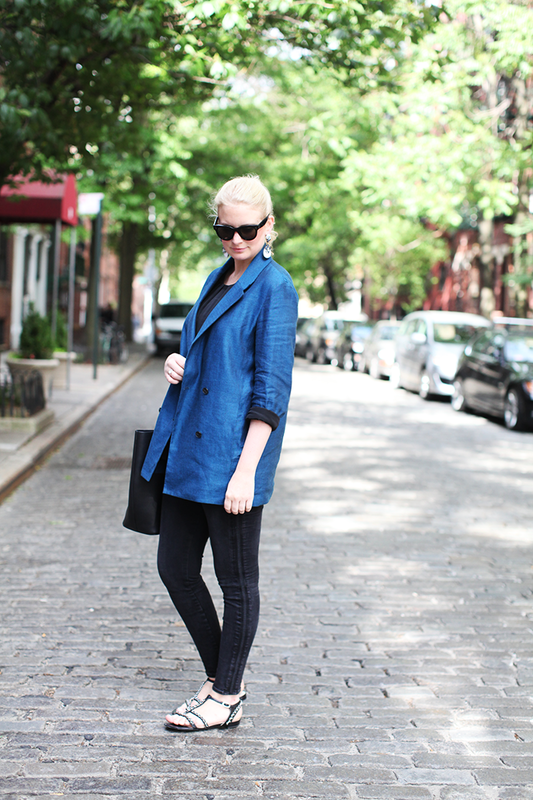 This blazer is great on you, and I love that you stuck to a black & blue color palette. Love the blazer and those amazing jeans! Love the side detailing- so cute! 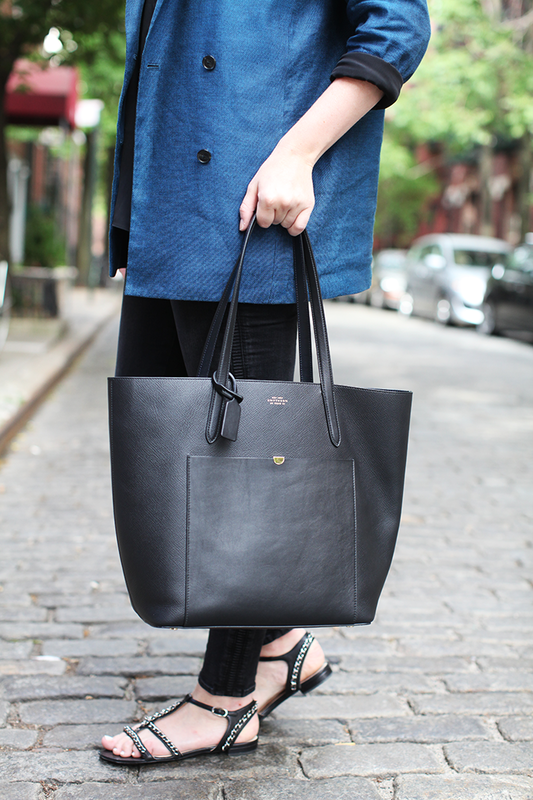 That Smythson tote is minimalist perfection! Simple and chic! Rediscovery is the best!!! LOVE the blazer!! It’s great to have a fun blazer for cool summer nights! gorgeous, girl! and love the BB earrings natch! I love that blazer so much! It is such a perfect closet staple. That structured bag is perfect. That blazer has such an 80’s vibe so I am allllll about it! Plus, it’s appropriate for an oh-my-gawd-I-hate-my-conservative-career work environment but with a bit of personality. Love it! LOVE this look. Baublebar is one of my favorites. Seriously so chic – love those earrings! Love your tote! Great styling! Absolutely love this look! Love the oversized blazer! You look fab! love your outfit :) and the styling is beyonddd perfect !